Discussion in 'Prius v Accessories and Modifications' started by S.Bell, Oct 30, 2018. I had to get my beautiful v jump started again but this time I was in the wrong parking lot and had to debate between a tow or to take the bus and buy a battery jumper myself. Needless to say, I choose the later, since I knew it was from watching a movie just a bit too long on Aux mode in my car. Well, the one I went for (Stanley Simple Start Lithium-Ion Jump Starter Battery Charger - Walmart.com) was at Walmart, and my cell phone died on the bus ride there. Sigh, so I ended up getting the Schumacher 1000 peak amps Portable Power Jump starter (SL1397). I got it started after about 5 times of having to the jumper on and off due to the Red warning light on it. Why did that happen? Yes, I hooked it up correctly to my hot spot under the hood and a metal spot just like all the other jumps I've gotten. I'd really like a recommendation for one that will work on regular and hybrid vehicles with up to v6 engines that can also charge batteries (AGM 6 and 12v) and test our AGM batteries in addition to jump starting our vehicles and batteries. Why so much ideally? I am trying to plan long term with possible switching of of my v and also charge of batteries for off grid options in future. schumacher is a good brand. what warning light are you talking about? The simple approach is to have the longest thickest jumper cable in your spare tire well. Maybe you can't jump someone else but you can flag another driver down and give a jump using your cables on someone else's stranded car. I find people are willing to allow you if you have the cables all hooked up and it will only take them a minute. And all you need to jump you is to flag somebody else. I do both all the time. Buy cables that will stretch 6 feet behind your car from the jump point. Aren't cheap but a good pair will last forever. They don’t always come out of the box fully charged. (My first concern). I had to get my beautiful v jump started again but this time I was in the wrong parking lot ...since I knew it was from watching a movie just a bit too long on Aux mode in my car. I am trying to plan long term with possible switching of of my v and also charge of batteries for off grid options in future. The small lithium jump start boxes for $100 or less will usually provide max amps for only a few seconds. They will never work on a deep discharged 12v battery like you may be seeing. They are intended for a slightly degraded battery that just needs a slight boost. If the car does not have 70% of its battery capacity left the small lithium units can't raise the system voltage enough. Most lithium jump starts won't attempt to output voltage unless a certain minimum voltage already exists. A few have semi-dangerous overrides of this protection. Usually it takes a large gauge jumper cable to another large capacity battery to start a car with a deeply discharged battery. Shops have big roll around jump starters that can mimic the instantaneous amp capacity of a big lead acid battery but most homeowner solutions work only on lightly discharged batteries. I think jzchen just switched to LiFePO4 12v battery? Those can discharge much deeper than lead acid. There was one I saw on ebay that will shut off when too low. But all you have to do is press a button and it will come back on only using what reserve voltage it has left. But it should start up on it's own only enough for the hybrid system to come back on to charge it. LiFePO4's are still new to the 12v car battery world, so there may be unknown issues. But their lifespan should be much longer than car lead acid batteries. For one thing, they will never go fully charged and that should increase life of the battery. LiFePO4 life cycle can be 2000-5000 deep cycles. Unlike lead acid 300-400. Which means one battery may last for the life of the hybrid car. Unfortunately just about all LiFePO4 batteries are made in China. So check quality of each brand. I was considering looking into these guys since they have distributors and batteries of different dimensions. I own a Renogy LiFePO4 100ah battery. I can easily run a cooker / water boiler with it at 1200watts with a 2kw inverter. But it is slightly too big for the Prius 12v. I had slight trouble with the casing design as it had mounting “feet” where you could hold it down at the bottom. These feet made it not fit quite well, but did with a longer bolt and a pack of washers. The battery in question has a built in voltmeter AND a backup battery built in. You press the button, (there is only one), and it displays current voltage and activates the backup source. A brilliant design in my opinion, plus a fraction of the cost of a Braille battery, which does not have a size specific for this application nor the aforementioned V-meter and backup energy source. The manufacturer is aware of the hold down causing problems, will make a change in the next batch, and will update the pics to the new design at that time. I don't think a combo device like this exists. I'm also leery of devices that are multi-functional in general - they often don't work as well as single purpose devices. 1) NOCO jump starter GB70 - will start almost anything. 2) High-quality desulfating charger - PulseTech XC100-P, CTEK MUS 4.3, BatteryMinder 1510 or equivalent. I'm also working with Toshiba LTO SCiB batteries. Pure power and pure deadly. 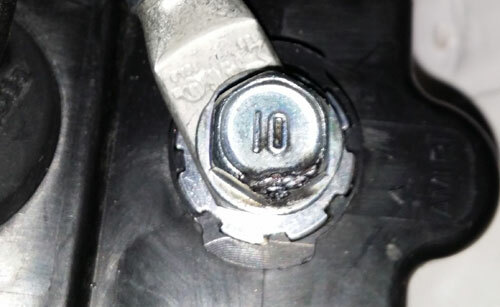 Just one accidental short and it nearly burned off the terminal bolt. This was only for a split second. So I do not plan to mention much about these batteries since they are too powerful and deadly to bring up for DIY. Wear safety goggle, gloves, etc. Note how much energy was depleted in charging the smaller Laptop battery. Looks like it fits the bill for the most part other than charging a 12 V car battery. Reviews seem to note that the air pump may not work well. I noticed on a yellow tag that once purchased charge as soon as possible, and then after every use also recharge ASAP. I wish I picked one up to gauge the weight, but I'm afraid I didn't. I got it started after about 5 times of having to the jumper on and off due to the Red warning light on it. It shouldn't take you 5 tries. Unless the jumper was really deeply discharged? You did switched it to the "On" position right? This guy didn't it his first try. If the problem persists where you still need 5 tries, I would return it and try a different unit. For jump starting I'm using a Clore Jump-N-Carry JNC660. It fits in the under-hatch-floor tray on our 3rd gen Prius, could also fit under a front seat I think. For recharging I'm mainly using CTEK Multi US 4.3. For battery assessment: Solar BA5 (also by Clore I believe?). mendel, you should start a business! you already have the knowledge, tools and time. It wouldn't work, I don't have the "look". Something else you might want to consider is a solar battery charger. PulseTech makes a 2-Watt solar charger that also desulfates, the SP-2 SolarPulse 12V Battery Charger/Maintainer. If you leave it connected, this would be more to make sure that your battery always has a full charge, rather than working as a rapid recharger. A cheaper option, rather than buying an expensive Li-ion battery jump-starter, would be to buy a small AGM battery along with one of the desulfating chargers. From what I gather on here, a 6 or 8ah battery is big enough to start a Prius. If you left the charger plugged into the small battery (and a wall outlet) whenever you weren't using the charger on your Prius, you'd have an always-charged backup. You’ve got a face for radio too ? How important is it to buy and install a "Grid Charger"
New Prius Li-ion battery possible as a replacement?